Health Insurers: A Bit Winded? Here’s news you definitely want to read: academic research showing that changes in the text of a company’s Form 10-K correlate to future changes in the share price, often months in advance. Before you say, “Well, duh,” let’s be perfectly clear. The mere fact that the text of the 10-K has changed is what correlates to future changes in share price — not what the specific changes actually are. That is, if a company starts using more negative language in the Risk Factors or MD&A sections, it’s highly likely that the stock price will decline several months later. Likewise, a company using more positive language will also likely see its share price rise. The specifics of why the language is changing — looming trade wars, recession risk, labor shortages, materials costs — don’t matter. The stock market rarely responded to the subtle hints in the reports immediately. In fact, it typically took several months for whatever good or bad news was embedded in the reports to be widely understood — and to move the stock market. This delay means that there is a profit opportunity for those able to exploit it, the researchers said. As it so happens, Calcbench subscribers can exploit those changes if you like. Our Interactive Disclosure tool lets you find specific disclosures quickly, and also lets you compare prior years’ disclosures — with color coding to help you identify what’s been added or removed. Users of our API may also be interested in knowing that this can be done programmatically as we have shown in previous blog posts. Take a look at this example, below. We pulled up Google’s risk factors disclosure. Its 2017 10-K disclosure is on the left, its 2016 10-K disclosure on the right. 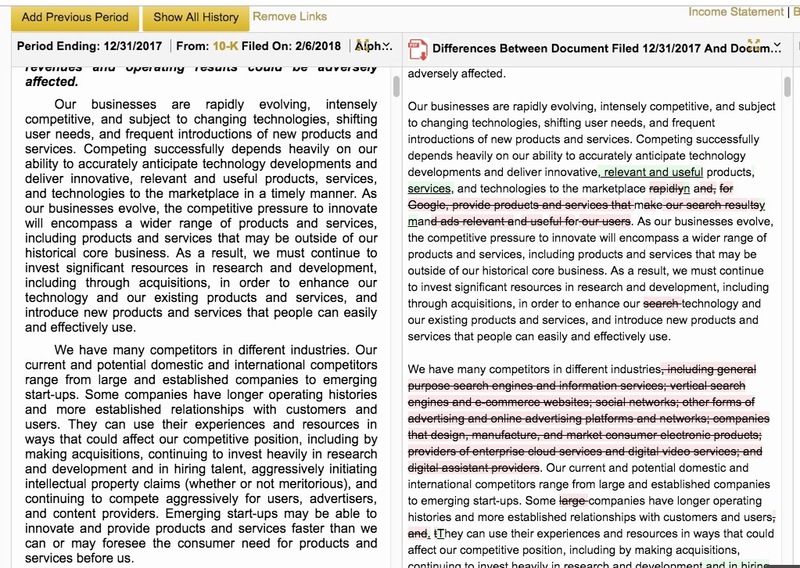 We can quickly see that Google deleted some language describing its competition from 2016 to 2017 (in red), while adding a quick line (shown in green) about investing heavily in “hiring talent” to its 2017 report that didn’t exist in its 2016 language. To find those changes, all you need to do is press the “Show All History” or “Add Previous Period” options immediately above the disclosure panel. The most recent disclosure will always appear in plain text. Changes will appear in the prior period: additions in green, deletions in red. There’s also that point in the NYT article that many investors apparently don’t notice or understand changes in the text for quite some time. To find a competitive advantage, then, Calcbench users can define peer groups of companies they follow, and set email alerts for when those companies have new filings. Once you get the alert that some new statement has been filed, you can hop onto Calcbench and compare that disclosure to prior statements using our process defined above. Research Financial & Accounting Data Like Never Before. More features and try our Excel add-in. Sign up now to try the Premium Suite.